ATLANTA — Used retail prices continued to surge in January, according to AutoTrader.com, which said that 18 of the top 20 most searched-for used units on the site saw their average prices increase from the year-ago period. Moreover, 12 of the 20 most popular used vehicles on AutoTrader.com showed double-digit price gains from the prior year. The Chevrolet Tahoe had the steepest upswing among the top 20 used units, as its average price climbed 22.05 percent. The Ford F-150 was next (up 21.4 percent), followed by Chevrolet Silverado (20.64-percent increase) and the Dodge Ram (20.6-percent upswing). "In the used-car market, we're continuing to see the impact of the reviving market and the tight supply of many used cars," explained Chip Perry, president and chief executive officer of AutoTrader.com. "We see signs of resurgence in the new-car market, which will help increase the supply of used cars, but demand for used cars is also returning, eating up the supply that is out there and pushing up prices," he continued. "As a result, used-car buyers may continue to be surprised by higher than expected prices when they visit dealer lots." As far as popularity, the F-150 remained the most-searched used unit, followed by the Silverado 1500, BMW 3-Series, Ford Mustang and Ford F-250, respectively. The most searched-for certified pre-owned model on AutoTrader.com during January was the 3-Series, followed by the Honda Accord, Silverado 1500, Tahoe and F-150. On the new side, the F-150 was also the most popular vehicle, with the Silverado 1500 at No. 2 and the Accord at No. 3. The Toyota Camry was No. 4, followed by the Honda Civic. Some of the new cars showing strong gains in searches were helped out by exposure at auto shows during January. For instance, the Mazda 3, following its showing at December's Los Angeles North American International Auto Show, climbed to No. 14 on the list of new-vehicle searches last month, up from No. 74 in January 2009. "The steep jump in searches on AutoTrader.com that cars experience following auto show unveilings and exposure proves the value these shows offer in generating publicity about these new cars and creating interest in them among the car buying public," Perry noted. Next, AutoTrader.com looked at the Toyota recall situation, and found that the automaker's issues did not significantly affect its vehicles' activity on the site. Officials said that the popularity rankings of most Toyota units — new and used — were relatively stable from December to January. In fact, the used Camry climbed to No. 19 on the list, up from No. 23 the previous month. "Through the beginning of February, we've continued to see stability in the supply of Toyota vehicles posted to our site and traffic to those vehicles," Perry stated. "Dealers are continuing to advertise new and used Toyota vehicles for sale on our site in normal numbers, we have not seen a jump in private sellers listing Toyotas for sale — meaning people who own them are holding on to them — and visitors to AutoTrader.com continue to review Toyota vehicles as they did before this news broke in late January," he added. "We will continue to follow this as it develops and Toyota works to alleviate the problems." Moving on, AutoTrader.com also noted that it hit a January record for traffic, as the site reached 15.98 million unique visitors. "AutoTrader.com continues to benefit from the movement of new and used-car shoppers online and the unique environment we've created that allows shoppers to compare cars across multiple categories: new, used, body styles, dealer specials and more," Perry shared. "We'll work in 2010 to continue to earn that traffic with exciting new online shopping products and functionality that brings car shoppers back over and over and helps the dealers and private sellers listing vehicles for sale on our site sell those cars faster," he added. In other news from the company, AutoTrader.com recently launched a new program that can help dealers attract more shoppers looking to trade-in a vehicle and purchase a new ride. The company said its Trade-In Marketplace program is designed to "take the mystery out of the trade-in process." It gives shoppers a guaranteed price for their trade-in, which they can redeem for cash or put toward a down payment at a participating dealership. The TIM program has been rolled out in Philadelphia; Kansas City, Mo. ; and Dallas, as well as in Georgia and southern California. More than 200 dealers have signed up in these markets so far. AutoTrader.com plans to debut the TIM in central Florida and San Francisco later in February and will spread it out to additional markets during the rest of the year. There is a planned roll out in Chicago and Phoenix in May, while the program will debut in New York, Boston and Washington, D.C. in June. Detroit, Cleveland and Minneapolis-St. Paul will receive the program in July, and it will reach Seattle-Tacoma and Denver in August. —Vehicle sellers can access the program either through http://tradein.autotrader.com/ or at a stand-alone kiosk at a participate dealership. They then enter in details of vehicle, including make, model, model year, major factory-installed options, as well as other upgrades and maintenance information. Sellers must also include details about the condition, including any major repairs or accident damage. —After this information is entered, the program configures a price that is calculated based on historical transaction data covering hundreds of thousands of units as well as the latest supply and demand information. It then shows a printable purchase offer. For shoppers at home, it provides a list of dealers who are participating. —The seller can then take this offer to the dealership, which will then inspect the vehicle to make sure that its description is accurate. The dealer then will write a check to the consumer, and as soon as the vehicle's condition is confirmed, the shopper can use it toward a down payment or just take the check. "AutoTrader.com is always looking for new ways to connect car buyers and car sellers", said Brian Skutta, the TIM general manager. "The Trade-In Marketplace does just that by taking the mystery out of the trade-in process. "For our consumers, it provides a convenient way of disposing of a vehicle," he continued. "For our dealers working with the program, it helps attract customers by providing a transparent and hassle free trade-in or selling experience." Moving on, AutoTrader.com also announced that it plans to expand its mobile-shopping platform next month so that can reach a wider array of shoppers. Executives said shoppers can utilize the tool to the "Find a Car" and "Find a Dealer" functions. It also allows users to easily access the "My AutoTrader.com" feature, which lets shoppers store, retrieve and reference prior searches. "Our goal with a mobile auto shopping platform was to come out with the right experience at the right time," Perry explained. "By studying the behavior of our site visitors, carefully reviewing the mobile shopping environment and consumer needs and taking a look at the expanded smart phone options out there, we believe now is the right time and this is the solution that will best meet our consumers' needs. "This expansion builds on the success we've had with our iPhone optimized site, launched in 2008, and our AutoTrader Latino mobile offering, launched in 2009," he continued. —An increased amount of AutoTrader.com visitors using mobile devices other than the iPhone. —Site-traffic patterns of mobile users on AutoTrader.com and other research, which found that finding units for sale and locating dealers was more important than other areas, including more in-depth auto reviews, research and compare functionality and other auto-related content from AutoTrader.com. —Weekends showed the heaviest traffic from mobile devices to AutoTrader.com, which — along with research — suggested that shoppers were using mobile devices to find vehicles and dealerships while they were out shopping. And while they were on the dealer's lot, shoppers were also using these devices to check and compare similar cars' prices at other area stores. Officials noted that traffic patterns to AutoTrader.com coming from mobile devices were pivotal in deciding to offer the company's proprietary "My AutoTrader" tool on the mobile platform. "What we see with our site traffic is that car shoppers research and compare vehicles, review inventory and specials and build their consideration set during the week from their home or work computer," said Perry. "Then, they use their mobile devices for quick checks and comparisons while they're on a dealer lot. "By making access to the ‘My AutoTrader' functionality a key component of our mobile environment, we give shoppers the ability to easily store their information on the cars they want while researching from a home or office computer and then shoppers can quickly access their searches via their mobile device while on the ground shopping," he added. Continuing on, AutoTrader.com noted that shoppers can use the "Find a Dealer" function to find dealerships through the mobile site. Users will have maps to the stores, and will be provided with the specific dealerships' addresses, phone numbers and e-mail contact information. When the mobile site generates e-mail leads to dealers, they will be designated as being from a mobile user. That way, dealers can respond quickly while the consumer is out shopping. The mobile shopping platform's address is m.autotrader.com. However, if a shopper goes to AutoTrader.com from a mobile device, he or she will be redirected to the mobile site. It is designed to recognize the type of mobile device, so that it can be optimized for that particular device. Officials noted that if shoppers access the mobile site through a smart phone and want to use AutoTrader.com's other features, they can simply select "View Full Version of Site." "We believe 2010 will be the year mobile auto shopping really becomes a mainstream activity because there are more consumers wanting to engage this way and more devices allowing them to do so," Perry noted. 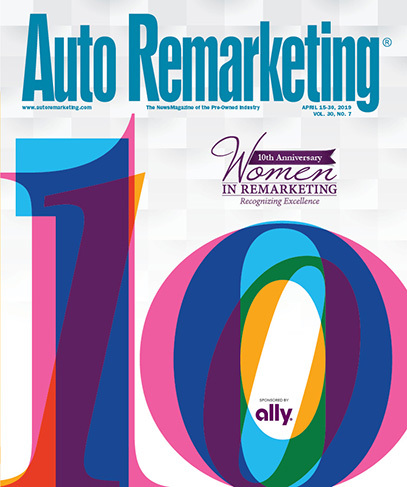 "As the leader in auto shopping, this is the perfect time to expand this functionality."